Nations on the spice roads not only engaged in transit trade, but inevitably made use of these commodities themselves, which is why Turkey has a significant spice culture. Spices were the commodity which lent momentum to the "global" trade of mediaeval times. For long centuries caravans carried their loads of spices and silks from India and China, respectively, overland while ships plied the route across the Indian Ocean to the ports of Arabia. Why were spices valued so greatly? Since eating is mankind's most fundamental need, ingredients which lent both flavour and fragrance were obviously important. Yet we cook many dishes using readily available herbs to give flavour, without feeling a need for adding exotic spices. So we have to look further for a satisfactory explanation. Historians argue that the primitive technologies used to preserve foods, such as drying meat which diminshed flavour, called upon the demand for spices. This is the most widely cited explanation, to which we can add the fact that spices assisted in the preservation of food, like the spicy paste coating the Turkish pressed beef known as pastirma. In addition, I would guess that people hoped for therapeutic benefits from spices, as well as flavour. Since many medicines were concocted from spices, it was natural to assume that they would do one good in food as well. In addition spices were attributed with aphrodisiac and similar elusive properties. The Ottoman Empire arose at the most strategic hub of this international trade, and in doing so upset everyone's calculations. With the Ottoman usurping their own sway over the lucrative spice trade, the European powers resolved to discover a new route to the land of spices, and sent out ships into the unknown. As a result their explorers ended up discovering the New World as well as the sea route to the East Indies around Africa. In this way, the Ottomans found themselves bypassed in trade, and consequently isolated from the mainstream of world events. Similarly the Italian city states such as Venice which had become rich on Mediterranean trade were drained of their former power. But spices retained their importance, and still do today. Nations on the spice roads not only engaged in transit trade, but inevitably made use of these commodities themselves, which is why Turkey has such a significant spice culture. Perhaps not comparable to India and the other countries of southeast Asia, but no country outside that region uses spices to the same degree. The areas of Turkey where the use of spices is greatest are those located on the spice trade routes. While the use of spices is moderate in northern, western and central Turkey, in the southeast region bordering on the Arab countries and extending down to the cities of Adana and Mersin on the eastern Mediterranean coast, spices play a key role in the cuisine. And of course we must not forget Istanbul, a major port and trade mart which also figured eminently in the spice trade. Throughout the middle ages consumers of spices in Europe were the rich; not unnaturally since the spices were an expensive luxury. So no money, no flavour. Since Istanbul was capital of the Ottoman Empire and its wealthiest city, consumerism of all kind was at its height there, and tons of spices of all kinds were transported here via the Arabian ports and Alexandria. The Egyptian Market or Misir Çarsisi where the spice sellers plied their trade was constructed in the 17th century as an appendage of the Yeni Mosque complex. Known to Europeans as the Spice Bazaar, the name Egyptian in the Turkish name referred to the fact that that country was a principal transit point in the transportation of spices. 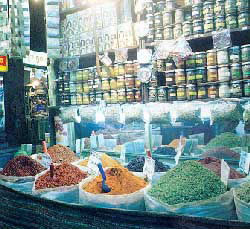 Spice shops in various districts of Istanbul also refer to themselves as Misir Çarsisi. 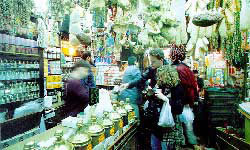 A second centre of the spice trade in Istanbul was Çemberlitas, near the Grand Bazaar. A few shops still remain, but their line in strange herbs laying claim to curative properties predominates over sales of spices for cooking. Galingale, senna, alkanet and some unidentifiable substance called "minaret shadow" are examples of the remedies on offer. Chili pepper is the best known of the spices favoured in Turkey's southeast cuisine, but this naturalised latecomer tends to overshadow the widespread use of Old World spices. 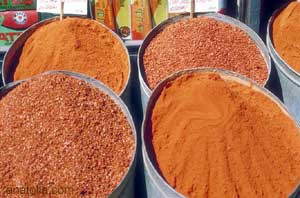 While cumin is an essential ingredient of meatballs in western Turkey, it is used in a far wider range of dishes, such as humus (chickpea purée) and liver kebab, in the southeast. Another ubiquitous ingredient is sumac, a tart flavoured red spice used in salads and to sprinkle over numerous dishes as a foil to rich cloying flavours. Sweet basil lends a delicious hint of aroma to "çig köfte", spicy balls of bulgur and raw minced beef. The Turkic peoples of Central Asia are fond of ground coriander on their kebabs, whereas in Turkey this spice is rarely used except by those whose families originate from Bukhara. Fresh coriander is widely used in Caucasia and Azerbaijan, either in salad or as a garnish, but again is uncommon in Turkish cuisine. Spices such as cinnamon, ground nutmeg and cloves are largely reserved for sweet dishes in Turkish cookery, the first two often sprinkled on milk puddings of diverse kinds, while in contrast they feature in meat dishes in Indian and Iranian cookery, and to some extent in the west. Saffron, the most expensive of spices, is used in pilaf, as it is in Iran and India, but its real place is again in a sweet rice pudding known as zerde. In short, spices lose their hegemony over cuisines the further westward one goes. In India, Sri Lanka and Indonesia, spices are more than mere flavourings, competing for precedence with other ingredients, while in the Arab countries they are used copiously but fall one step behind in the ingredients ranking. Although the Turkish cuisine takes a still more measured and selective approach to spices, the large and colourful variety on spice shop shelves, from cardamom to sweet marjoram, demonstrates that this is still a spice-conscious tradition.